I want a client to be able to select the catagory of file they would like to submit, and also require them to upload the exact amount of documents needed for each individual checkbox item. If you look, each checkbox underneath the catagory selection drop down menu corresponds to a collapsable feild at the bottom. Each collapsable feild requires around 3 files to be uploaded in order to satasfy our needs for effeciency. How can i let someone click a check box at the top and have it take them to the correct collapsable field? How can i make individual check boxes a requirement to check, or number of files uploaded a requirement before hitting the submit button? Thanks for trying, please let me know if you come up with anything. After you created the condition for the dropdown field to display appropriate checkboxes for the selection, you can now add another sets of conditions for the multiple selected checkboxes. I was able to test this on 2 page break (after removing all the collapsable field), and it work. It can be a slow process on my part because of the complexity of the form and my limited familiarity about it. However, I think you can do it much faster and efficiently. Please inform us if you require any other assistance. Thanks for the help guys, I will give this a shot! Feel free to come back for more help whenever you need it! I have all the individual checkboxes conditioned to skip to the corresponding pages at the bottom. And i am beginning to set up the multiple selected checkbox condition that Jonathan suggested above. Right now the pages are skipping to the correct starting point, but the next button keeps going to the next page even if the corresponding check box was not clicked. This is my goal. I want to recieve ONE email containing all the clients documents that correspond to the checkpoints (for example ss 1.0, ss 1.1, ss 1.2 etc. all require many documents in order to obtain points). Therefore, my clients should be able to click ALL the checkpoints underneath the catagory drop down list, upload their files, and then submit. But the pages keep skipping to the next page even if that checkpoint wasnt clicked. How can a user click two boxes, upload their files, and then skip to a submit button? I think that you may try the following simple solution. 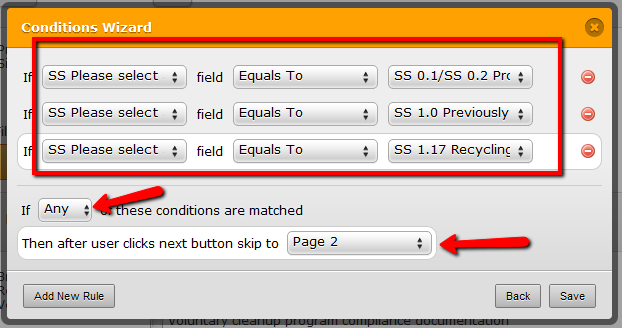 Add one page break to your form, then use Show conditions to show needed fields on the second page of you form. If SS 0.1 is checked show two required fields (Check Box & Upload as on your form), and if SS 1.0 is checked too, show two more required fields, and so on. You can also Clone it in order to check its back-end.